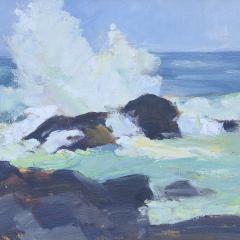 "From sleepy harbors to raging seas, marine paintings always tell a story. Several are historical, identifying specific ships or events in history. 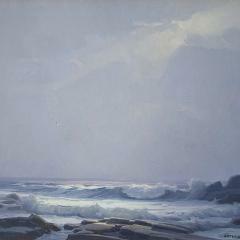 Most attempt to examine the light and dynamism the ocean can provide. 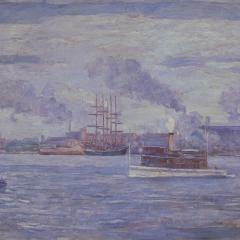 Each painting should be judged in the style in which it was created. 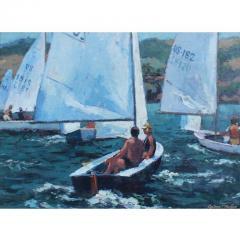 If you do not find a marine painting you are looking for, please call or email, we may not have cataloged it yet."" 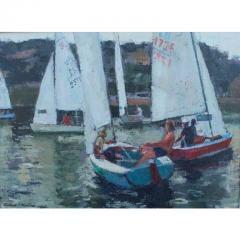 Oil on canvas of racing sailboats in a harbor. 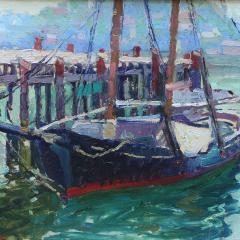 Oil on canvas of a boat docked in Gloucester Harbor, Massachusetts. The town seen riseing in the background. Glocester was a popular location for many artists to spend thier summers painting. 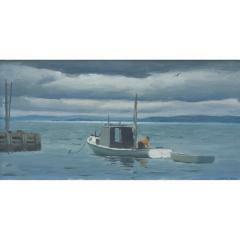 Inscribed as a gift and bearing a Dawson Gallery label on verso, this subtle coastal scene with vibrany figures is nicely composed. 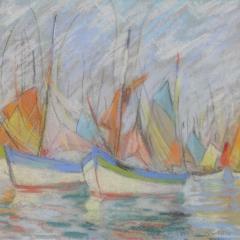 It is signed lower left by Henry Aiken Vincent. A calming coastal view depiction by the "father of the New Hope artist colony", William Langston Lathrop (1859-1938). It is signed lower right and titled on verso. 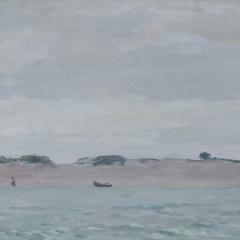 A New England coastal scene which it titled on verso with artist stamp and it is signed on lower right. Painted in Concarneau in the northwestern part of France (likely during Washington's Cresson Scholarship), this beautiful harbor scene is vibrant wih pastel colors and nicely framed. It was signed lower right and titled on verso. 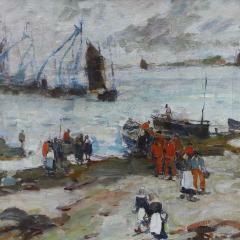 A strong example of the coastal scenes considered so desirable by Constance Cochrane (1888-1962). This work is unsigned, but was acquired directly from the Cochrane family. 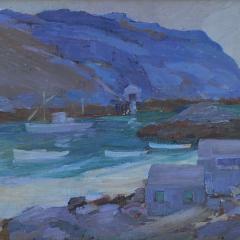 A nice harbor scene painted by Constance Cochrane (1888-1952) of Monhegan. It is unsigned from the family's estate. 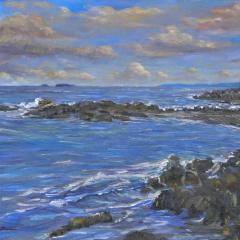 Maynard characteristically painted impressive skies and this seascape is no different. It is signed lower right. 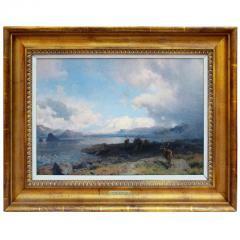 Engaging harbor scene in reproduction gold frame by a leading Philadelphia painter and teacher.